Alcona County has a detailed page on their website, listing out all the records it offers, as well as dates, prices, and how to obtain them. All records are certified and cost $12 for the first copy, and $5 for subsequent copies. Birth, death, and marriage records are all available from 1869 to the present. Records can be obtained either by visiting the County Clerk in Harrisville, MI., or by mailing an application to Alcona County Clerk, PO Box 308, Harrisville, MI 48740. 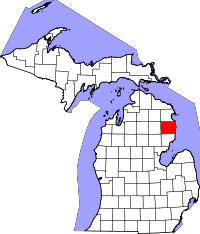 Alcona County is the first county in the state of Michigan, alphabetically, and it is quite proud of that fact, listing its motto, "First of 83" on the county flag. The county was established in 1840 and was initially known as Negwegon County after a famous Chippewa chief, however it changed the name for Alcona three years later.